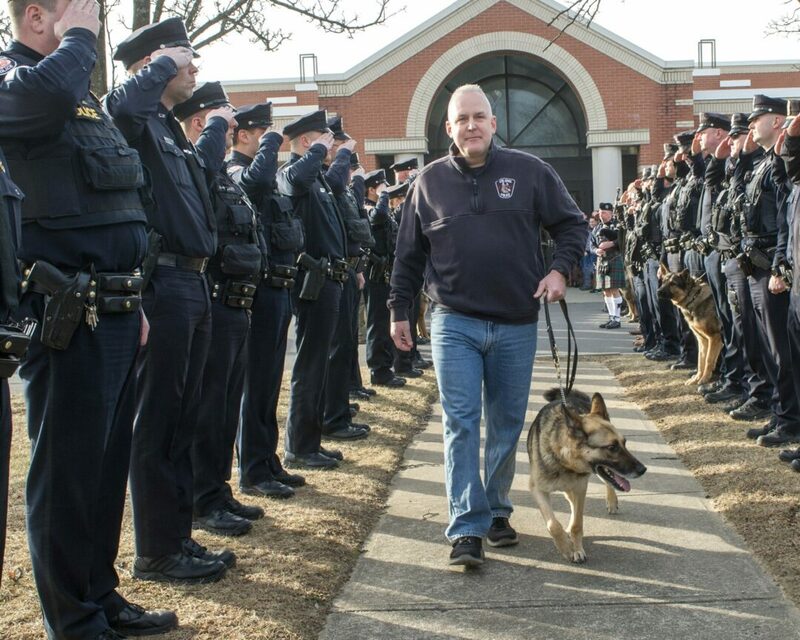 COLONIE — After nearly three decades in law enforcement, officer Gerald Shaw and his K9 Vader were honored at a retirement walking out ceremony in front of the Police Department on Thursday, Jan. 17. Shaw spent 22 years with the Colonie Police Department and nearly six at the Albany County Sheriff’s Department. Shaw has been a K9 handler since 2003, the first 10 years with Beny and the last five-plus years with Vader. He and Vader assisted in 182 drug searches that led to the recovery of 128 pounds of marijuana, 11 pounds of cocaine, four ounces of heroin, two ounces of MDMA, 150 steroid pills and $140,740 in illegal proceeds as the result of drug trafficking. They also participated in 90 tracks of suspects or missing persons, 25 building searches, 12 area searches, eight evidence searches, 93 demonstrations and 14 assists on perimeters. They also provided assistance to 13 outside agencies. The team was once called to a Mobil Mart after it was robbed at knife point — the suspect didn’t make it far before he was in cuffs. And for the last three years he was the lead firearms instructor at the Zone Five Police Academy. He set his sights on being a K9 handler early in his career, and is a big reason the K9 program still exists in the Colonie Police Department. While Shaw is ready to retire into the sunset, Vader isn’t. In fact, Shaw said he didn’t tell the 7-year-old German shepherd about it before his ceremony, which was attended by past and present colleagues and other K9s and handlers from around the area. A package, Shaw said, he wouldn’t have changed, even for a human partner. Shaw still plans to attend training sessions with Vader so the Slovakian-bred K9 can keep up with his skills, but for now Shaw is taking a break to de-stress and spend more time with his family. The hardest part about retiring, he said, will be leaving the people he had the opportunity to work with over the years. “Gerry is a great guy and he’s done a great job and we are going to miss him but he is onto the next chapter of his life and we wish him well,” said Supervisor Paula Mahan.